While I was doing housekeeping on my harddisk, I found out this food post was inadvertently missed out in my Singapore trip. That's one of the issues with digital camera, unlike film camera era, it virtually costs nothing to take more photos. But when come to file management, that's where the pain comes. Sometimes thousands of photos were taken in a short trip, and to go through each of them is an eye strain, you could easily miss out some scenes that you wanted to share. No photos of how did the actual serving look like. Frankly, the outlook of the serving wasn't as attractive as the menu, but taste was good. As I always say, sweet things are easily favorable by many as long as it's not very sweety like eating plain sugar. 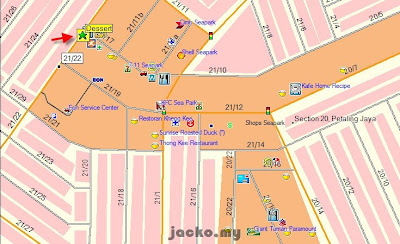 It's a stall in a typical kopitiam, GPS coordinates (estimate) N3 06.609 E101 37.294 and business from 5:30pm onwards. The stall closes business once a week, but I can't remember the day. May be I shall drop by on one of the days when heading home from work.